Tonight I will be covering the benefits of the hip thrust, and all the good it can do for you and your glutes. In this article, I am just covering a few things you need to check off as you are performing the movement. Get the box/bench or whatever you are using for elevation in a comfortable position. For most individuals, this will sit right below their shoulder blades at the start of the lift. Drive through the heels. For me personally I let the person doing the lift decide how to go about this, meaning they can keep the feet flat or slightly lift the toes. In general, if a client feels their glutes working I make no adjustment, if they are having a hard time feeling their glutes I recommend going with a toe lift. Vertical shins at the top. At the top of the lift the shins need to be vertical. This ensures maximal glute activation is being achieved. If the shins are leaning forward chances are there is too much quad involvement and if the shins are leaning backwards there is probably too much hamstring involvement. Knees out. Be sure the knees do not fall in. Similar to the last point, if the knees fall in maximal glute involvement will not be possible. The hips need to be externally rotated at the top of the lift. Extend the hips fully and keep the ribs down. 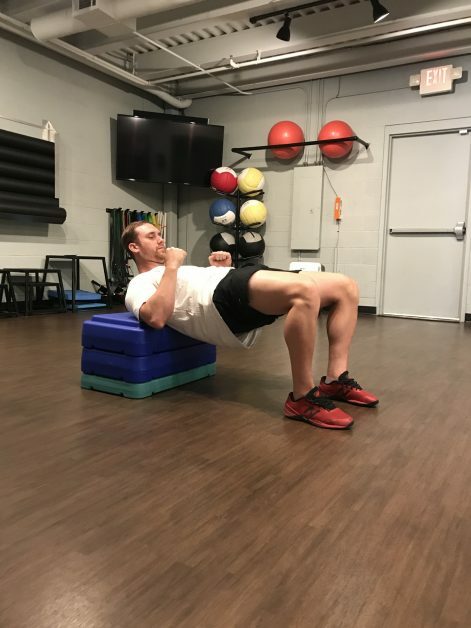 When I see some people, hip thrust they either don’t fully extend the hips, or they mistake hip extension with lumbar extension and rib flare. If the ribs flare up lumbar extension will always follow. Posteriorly tilt the pelvis. I make a bigger deal out of this for clients who stand in an anterior tilt all day. For me this cue becomes a “corrective” and allows people to get back to a neutral state. For those already in a neutral state I don’t enforce this as much, unless I see the ribs start to flare. Look forward. This is another cue I love, but can vary person to person. In my experience, this cue helps keep the ribs down, achieve a posteriorly tilted pelvis, and it keeps the lifter under control. I’m not a fan of people looking at the ceiling, as I have found this encourages an uncontrolled hip extension, increasing the likelihood of bad form and a hurt lower back. Tight hands. If you are thrusting with no weight make a tight fist. If you are using weight grip the weight as tight as possible. This helps ensure maximal tension throughout the body. Brace your core. For me I like to take a big breath in, thinking about making a big belly. This helps ensure tension inside your body, keeping the spine safe. Pause at the top. This like some of the previous points keeps the lifter controlled. It also helps ensure maximal hip extension.